I often encourage collectors of Middle Eastern rugs and other tribal textiles to experiment with a few of the simplest weaving techniques. Handling some yarns and interlacing or wrapping them yourself is guaranteed to help you understand the structures better, and increase your enjoyment of the textiles. Also, it's fun. Often when I am puzzled by a woven detail, I reach for a simple frame loom that I keep warped and handy. By trying out unfamiliar techniques, I make sure that I understand them correctly. A big, fancy loom is not necessary for that. Here, we will "reinvent" basic loom mechanics from scratch -- step by step. Then, with my manual, WOVEN STRUCTURES, at hand, you can try whatever basic techniques you wish. I suggest that in the beginning you weave a narrow "sampler," trying several techniques and experimenting with various weights of yarn and warp spacing. After that you can use the most satisfactory methods and materials to produce an actual finished piece. 1. First, a frame. Easiest of all is to rummage through your attic, basement or garage to see if you can find a sturdy old picture frame. Remove the glass, and Presto! You have a loom. Thirty to forty inches in the greatest dimension is ideal, but other sizes will work too. It does not need to be wide for experiments. If the wood has rough spots, give them a swipe or two with sandpaper. Alternately, you can build a simple wooden frame of 1 by 2-inch boards. You need not miter the corners -- instead, the frame is stronger if crosswise end pieces are simply nailed, screwed or bolted to the front of the long side pieces. When you think about the size, keep in mind that your weaving cannot be the full length of the frame. 12 to 15 extra inches of warp are needed for opening a shed. 2. A wooden slat for a shed stick. Wood lath is a perfect size: 1½ inch wide by ¼ inch thick, and as long as your frame is wide. Drill a hole near each end. 3. A extra wooden slat or two may be useful for tension control. These should be about the same size as the shed stick, but holes are not necessary. 4. 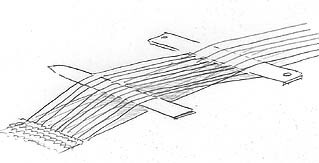 A wooden slat with one end shaped in a flat, tapered point, if possible, for a pick-up stick or weaving sword. Same size as the pieces above. You can saw out the basic shape of a point, then taper the side edges of this point with a rasp, and finally sand it smooth. It is not essential that you have this piece to get started. 5. A wooden dowel for a heddle bar. A thickness of ½ inch is good. Cut notches or grooves near each end. 6. A common table fork for a beater; also scissors, and twine. At your neighborhood weaving, needlework or craft supply shop, look for sturdy wool yarn that is tightly spun and plied to use for warp yarns. Rug, tapestry or knitting wools are OK for wefts, but I suggest you avoid fluffy yarns. You will need perhaps two or three colors for wefts, and none should be heavier than your warps. A still thinner wool weft yarn will also be useful -- preferably in a neutral color or one similar to your warp color. You will also need some twine for heddles. Tie your warp yarn around the bottom end of the frame and then wrap that yarn around and around the frame lengthwise. Try not to stop until you are finished, so the tension is even. End by tying on to the bottom end of the frame. The yarns should be fairly taut, with just a bit of flexibility. Where they round the frame, place them about ¼ inch apart. Your weaving can be whatever width you wish, although a 5 or 6-inch width is probably good for an experimental sampler. For this first weaving, I suggest that you combine the two layers of yarns by pulling them together at the lower front end of the frame with a row of twining. Cut a separate length of sturdy yarn at least 3 times the width of your warp. Place the center of this twining yarn at the left side of the warp, with one end below the first warp yarn, and the other on top. Enclose this first warp by twisting the two yarn ends together. Tighten, then repeat, enclosing the second warp, then the third, etc. Enclose yarns alternately from the top and bottom layers. Always twist the twining yarns in the same direction. You will probably need to do a little "adjusting" until you get the hang of twisting the yarns evenly. You can pull the warp yarns sideways, one after another, to tighten and even up this first row of twining if necessary. After you have twined all the way across the warp, take whatever time is necessary to space everything evenly on the frame. The warps should be close together, but not touching -- perhaps about 8 per inch. You can adjust the spacing by twining with a thicker or thinner yarn. 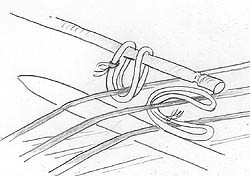 Finish the twined row with an overhand knot. You have now already learned one of the world's oldest and most basic textile construction techniques. The photo shows an ancient Peruvian fabric (a mummy wrapping) made entirely with widely spaced rows of twining. This is a tedious way to make a fabric, indeed, but it is an excellent way to secure and space your warp yarns evenly. Before we go on, you might want to try twining with two colors. Just knot a light and dark yarn together, and start with the knot at the edge. After one row of this two-color twining, try reversing the direction of twist in the next row, to produce a decorative chevron effect, as in the lower part of the drawing. This is countered twining. You could try enclosing two warps between twists if you wish. This is two-span twining, and is what you see in the Peruvian fabric. You could twine with several yarns together and span still larger groups. Some weavers have done fancy patterning by changing span lengths or changing the way they have twisted yarns. 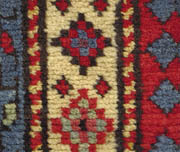 The textile on the cover of Woven Structures shows a complex twined Moroccan fabric. Since you now have a taut, even warp, you could do several kinds of simple constructions with no further loom refinements. To make a plain weave, you could just interlace weft yarns by hand, one by one, over and under the warps; then pack them into place; then interlace over and under the opposite warps. This is SLOW though! You should quickly discover that your frame loom produces a natural shed that separates the warps into two groups, since your warp yarns are held apart where they encircle the far end of the frame. Insert a wooden lath (the one with holes drilled near the ends) through this slight opening, and you have a shed stick -- a basic loom part. By turning this slat on its side, you can widen the space between alternate warps, making a shed through which you can easily insert your weft. To keep this shed stick from slipping out, thread a piece of twine through each hole, then encircle a side of the frame, tying each to form a very loose loop. The slat must be free to move easily back and forth. Now you're ready to weave! Get comfortable, with one end of the frame in your lap and the far end propped on a convenient table. Pull the shed stick toward the center of the frame, and turn it on edge. Put your first weft yarn through the wide open shed. By providing this extra yarn length -- or weft ease -- you allow the wefts to cover the warps completely, making a weft-faced weave that is typical of all kilims and the ground weave in a majority of Middle Eastern tribal pile rugs. Rugs woven without enough weft ease often tell us that the weavers were beginners, or were weavers without a lengthy tradition behind them, as such a structure is not compact. Inserting the wefts without enough ease can also cause a weaving to "draw in," and become narrower. Inserting wefts inconsistently results in a crooked weaving. 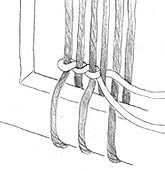 For the second weft, you will have to interlace the alternate warps by hand. There is no way to use two shed sticks together. If you don't believe me, try inserting one either in front of or behind that first slat! Instead, to produce a plain weave you must alternate, first using the shed you can produce with the shed stick, and second, interlacing by hand. If you have made a pointed pick-up stick you can use it to select or "pick up" the proper warps to lift for your second shed, then turn this stick on edge to open a clear shed for your weft. Be sure to "bubble" each weft before packing it into place. You of course have to remove this pick-up stick before you can open the next shed. Well.........after you've done this for a while, I'm sure you will agree that it's a laborious way to make a fabric! Primitive peoples everywhere produced plain- weave fabrics this way, however, before inventing HEDDLES! 5. Hallelujah! Heddles! and a Heddle Bar! Heddles are one of the greatest inventions of all time! All around the world, ingenious weavers came up with the same idea, revolutionizing weaving technology. All other loom refinements pale in comparison. By attaching string loops around those warp yarns that lie UNDER the shed stick, you can lift them -- once your shed stick is flattened and pushed back out of the way. By putting a series of such loops on a rod, you can lift all of the selected warps together! 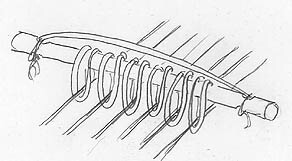 Most tribal weavers use a continuous string to make a series of heddle loops. Since these can slip and slide and become a tangled, uneven mess, I'll describe my favorite foolproof method for klutzy weavers. First, make a series of identical separate string loops. I like to pound two nails (without heads) into a board about 7 inches (18 cm) apart, and tie my heddle loops around them. If you have a total of 60 warps, you will need 30 heddles. You can use them over and over again for future weavings. Now, back at your loom, with your pointed pick-up stick, pick up all of the warps that lie UNDER your shed stick. Do this IN FRONT of the shed stick. This means BETWEEN the shed stick and the area in which you weave. If you haven't made a pick-up stick, use one of your extra slats, or a ruler. Even a knitting needle will work. The warps you have picked up are the ones you will enclose with heddles. Slip one end of your first heddle under the first raised warp. Then put both looped ends over your heddle bar -- your notched dowel. Then do the same with the next, and the next. When finished, take a separate string and tie around one notched end of the dowel, then bring it along the rod to the other end, and tie it around that notched end. This will keep all of the heddles safely on the dowel. Now, with separate short strings, tie onto each end of the dowel and make loose loops around the loom frame, as you did with your shed stick. Tie these so that they form long, loose loops. THAT'S IT !!! Like magic, you can now open TWO different SHEDS on your loom. To weave, you first pull the shed stick forward and turn it on edge, insert your weft, bubble it, and pack it down; then for the next shot, you flatten the shed stick and push it to the back, out of the way, and pull the heddle bar upward to open your second shed. Do this half way between the shed stick and the fell (front edge) of the cloth. Insert your pick-up stick in the space you have opened and turn it on edge to hold the shed open while you insert a weft. All around the world, this is the basic loom mechanism used by primitive weavers. No matter how loom frames are constructed, the shed-making operations are essentially the same. Nomad weavers who stake front and back beams to the ground, instead of using rigid frames, still create their sheds with heddle bars and shed sticks. In place of a shed stick, some weavers have used a second heddle bar. To do fancier weaves, like twill, more heddle bars are needed to lift various combinations of warps. For most of the basic Middle Eastern tribal weaves, however, only two alternating sheds are required. 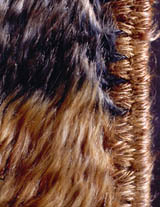 These weaves are referred to by Western artisans as "non-loom-controlled techniques." You might want to wind some weft yarn around a simple stick shuttle, although for a small weaving I find that is too much trouble. Like most rug or tapestry weavers, I prefer to make a small "butterfly" with my weft yarns... winding them in a figure eight around my thumb and first finger, then binding them around the middle. In use, the first yarn end can be pulled from the center of the small finger skein. Or you can just make a small wad of yarn that is easy to put through the sheds. A ball does not work well, as it is too thick, and is also hard to handle. Now you're on your own. First, try to produce a nice weft-faced weave. If the wefts do not cover the warps, then you may need THINNER weft yarns (NOT thicker!!! ), or you may need to space your warps a little farther apart. To do this, try twining with a slightly heavier yarn. When you are doing a plain weave, you can easily make crosswise stripes of course, but then try alternating two colors to see how weavers produce their pick-and-pick weaves with small vertical columns of color. You will have to twist the two weft yarns together at the selvage. Don't forget to bubble the wefts. Then try some TAPESTRY techniques (Chapter 6 in Woven Structures). Slit tapestry is easiest, and you can try weaving separate sections: first with short vertical divisions between colored areas, then diagonals. But, again, don't forget to bubble the wefts! You can try weaving in one narrow, small area, and then curve wefts around it. You might try some dovetailing -- sharing warps between pattern areas. Then try interlocking wefts. SOUMAK wrapping is easy on a frame loom, (Chapter 5) and you can try both countered and non-countered variations. I suggest that you use a thinner yarn for ground wefts between your rows of wrapping. Try any variations that have might have puzzled you -- reverse soumak, for example. Try weftless soumak, a variation used by early weavers who had not yet discovered heddles. You will see that it is a much less stable structure. KNOTTED PILE is easy (Chapter 2). 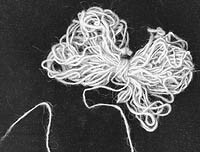 Try each kind of knot with a short length of yarn first, and then try to figure out how you would tie it with a yarn end if that yarn was still attached to a ball. Asian weavers do it that way: tie and cut, tie and cut. 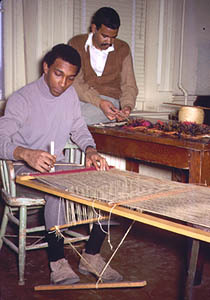 Westerners usually work with a butterfly and continuous yarn, cutting a row of pile loops afterwards. Symmetrical knots may be the easiest at first. Experiment to see if using a single yarn makes thick enough pile; you might need two yarns together. Or maybe even more if your yarns are fine. Use a fine yarn for your ground weave between rows of knots, bubbling the weft for best results. It will be easiest to leave your pile fairly long, and use several ground wefts between rows of knots, as does a gabbeh or tulu weaver. If you try some BROCADING, be sure to realize that your ground weft yarns need to be much thinner than your patterning yarns (Chapter 8). Tribal weavers usually just interlace each yarn separately with their fingers, but you can use the pick-up stick to select yarns for the pattern if you wish. The same is true for COMPLEMENTARY-WEFT weaves. The manual, WOVEN STRUCTURES, should help you to experiment with these basic structures. For more information, and an order form, click here. Several years ago, one of my clever weaving students devised an ingenious addition for our simple frame looms. William Murray (in back, in the photo) rigged up a heddle bar on the underneath side of his frame, then attached a long cord and a treadle! John Dickey is using such an arrangement in the photo. This speeds up the weaving considerably, and makes a simple frame quite convenient for tapestries and other small weavings. A shed stick is still used for one shed, and alternates with the treadle- operated heddle-bar shed. One could, of course, make a second heddle bar and treadle to substitute for the shed stick, but the advantages of this would be less dramatic. With your frame warped as I have described above, you can simply turn it over to work from the back, and try attaching a long cord and treadle to the heddle bar. Ease the shed stick to the top side of the frame. Find a piece of heavy, but loosely woven fabric. Turn under and stitch a thick hem along one edge. Then with a heavy yarn needle, stitch lengths of yarn through that hem to simulate 10 or 12-inch rug fringe. Presto! A Warp-End Finish sampler. If the yarns are not secure, you may need to stitch twice through the fabric with each length. Now go to the End Finishes pages and with the diagrams you should be able to duplicate the structures. Among the easiest to begin with are half-hitch finishes. If the warp on your frame loom becomes loose and saggy, you can insert an extra slat or two under the warp at the top end, and lash these slats to the frame. It's an easy and effective solution. The most difficult achievement for new weavers is a good weave balance, and it is hard to offer advice on this without seeing your yarns. So be patient and experiment a bit with putting warp yarns closer together, farther apart, etc. If you have problems, e-mail me, and I'll try my best to help.